Boston Bruins Off-Season Preview: Let's Make a Deal? Boston Bruins Off-Season Preview: Let’s Make a Deal? Two weeks have passed since the Boston Bruins dropped game seven in overtime to a Washington squad led by a plucky young goaltender. As the sting fades and with the free agency and NHL Draft picture clearing, we are left to debate the B’s summer plans. Despite their abrupt dismissal from this summer’s festivities, Boston fans shouldn’t be reaching for the Prozac. The Bruins’ 2012-13 outlook is far from brutal: Tuukka Rask, the most critical free agent on the B’s docket is a RFA while Boston has upwards of $9 million in cap space (when including Marc Savard on LTIR) with the vast majority of their core signed. In addition, the Black and Gold are young and have several talented players who should be making the jump from junior competition in the coming year. Still, this off-season won’t be without its complications. Even with GM Peter Chiarelli’s recent statements to the contrary, the team may explore dealing two-time Vezina-winning goaltender Tim Thomas to free up additional space (and receive some value before his contract is up). The Bruins will have to deal with the preliminary difficulties of contract-ageddon 2013, with Tyler Seguin, Milan Lucic, Nathan Horton, Brad Marchand, Andrew Ference, Jordan Caron, Anton Khudobin and Thomas. Speaking of Horton, while Chiarelli has inferred he expects the power forward to recover from his second concussion in under a year, concern within the B’s community for Horton’s health and future with the organization won’t go away. Further muddying the waters is the real need to upgrade on the powerplay. For the second consecutive postseason, the Black and Gold struggled mightily with the man-advantage. Arguments and proposed solutions abound, but will the team pull the trigger on a major addition or a peripheral one? The Bruins have several players headed for unrestricted free agency on July 1. Up front, four bottom-six vets may test the waters and there’s an outside chance that all four will be brought back. Campbell and Paille are probably due significant raises from their $1.1 million annual salaries, but not so much that they should price their way out of the B’s plans. 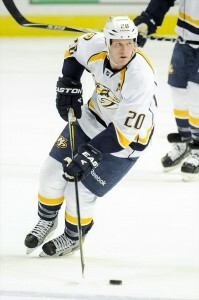 Kelly may find more than a few suitors on the open market following his career-year in ’11-’12. He’s the quintessential Claude Julien-type player (rugged play, excellent defense and leadership) but there’s a distinct possibility that his first career 20-goal season might earn him a contract that exceeds his value. Expect the B’s to make every reasonable effort to sign him, but they can’t afford to pay him top-six dollars (which could easily be the end-result of his efforts). Rolston’s performance following his movement from Long Island to the Hub warrants some interest (particularly as a 3C backup plan if the Kelly negotiations fall through) but unless he’s willing to take a hometown discount in the realm of $1.5-2 million, his time in Boston next season will be via the visiting locker room. On defense, the B’s may wave goodbye to a trio of blueliners whose time in Boston was limited to a single season – and less. Corvo didn’t manage to meet even the lowest of expectations and while he certainly earned more than his share of derisive commentary from the fanbase, he wasn’t a fit in any sense. Zanon would make a solid bottom-pairing Bruin-type blueliner but his price-tag will likely wind up too costly for Boston to re-up the shot-blocker. If Mottau takes a serious hometown discount, (close to the League minimum) he could be brought back in a depth role. 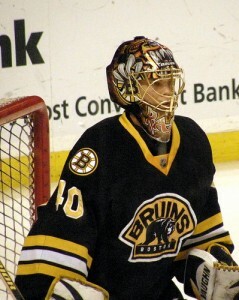 Rounding out the B’s 2012 UFA class are goaltender Marty Turco (who will not be back), and a trio from Providence. Hennessy (like Mottau) is a Massachusite who had a solid season as a depth forward and one of the P-Bruins scoring leaders but was pricey (by AHL standards). Nathan McIver and Zach McKelvie are stay-at-home types who might become victims of the B’s over-abundance of AHL defensemen and situation up against the 50-contract limit. Rask is the obvious headliner among this season’s Black and Gold RFA-class. He’d be the definitive starter on a third of the teams in the League – and very arguably many more. He’s due a hefty pay-raise from his $1.25 million salary in 2011-12, perhaps as much as three hundred percent. Rask may desire the outright job as starter before he puts any ink on a new deal and that could potentially hamper negotiations. Still, unless his demands reach the stratosphere, re-signing is an absolute no-brainer for Boston. 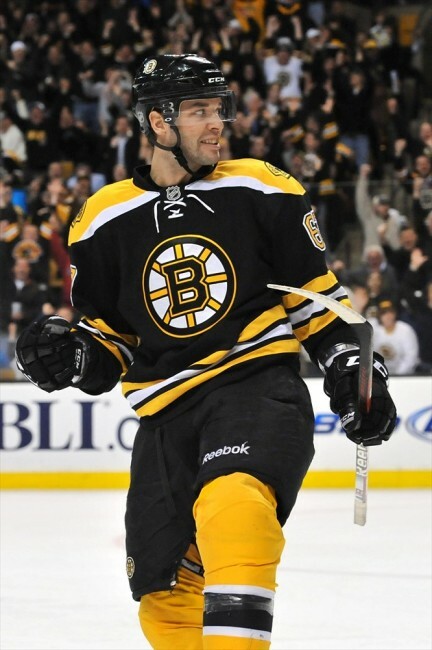 The only other RFA who spent most of ’11-’12 in Boston is Pouliot. A pleasant surprise, the former fourth overall selection in 2005 performed solidly (if unspectacularly) within Julien’s system and warrants at least qualification at his current $1.1 million salary to ensure the B’s control of number 67. Hamill continues to frustrate. The B’s first-round pick in 2007 (eighth overall) has yet to score an NHL goal and underwhelmed in sixteen games with the big club. Still, he should be re-signed as the B’s hope the light will come on and they can get something of value for him down the road. Arniel, Bartkowski and MacDermid should all receive new contracts from Boston as they represent top-twenty prospects in the B’s system and retention ought to be an afterthought. Bodnarchuk is arguably a career-AHLer, but he occupies a leadership role in Providence and is a dependable (if undersized) blueliner for the P-Bruins. Chaput and Courchaine will have to sign outright with Providence or find employment elsewhere. Tim Thomas: Should He Stay or Should He Go? The Bruins’ first two-time Vezina winner in over half a century, Thomas won the hearts of fans in Boston and around the world with his rags-to-riches success story and amazing Stanley Cup performance in 2011. However, after taking a step back in ’11-’12 and sparking controversy with some political statements, the bloom is (perhaps) off the rose. Even though he was outplayed by Braden Holtby in the B’s eventual first-round loss, Thomas was not the issue as 2.14 GAA and .923 Sv% will certainly attest. He’s still very capable of shutting down the opposition as well as any ‘tender in the game and there’s a good argument that he’d be the best goaltender in Boston again next year. Nevertheless, the Bruins may like what they’ve seen from third-string Anton Khudobin enough to roll the dice on a deal when Thomas’ no-movement clause expires on July 1, perhaps netting them another finisher up-front or a puck-mover on the back end (or at least some futures) before his current deal runs out next off-season. There’s no ‘clean’ solution for Bruins’ brass. If they chose to keep Thomas, they risk losing him for nothing in 2013 and their cap situation for the upcoming season is a little murkier (and a run at a big fish in the free-agent market is all but out-of-the-question), plus they’ll need to once again navigate the troublesome waters of two number-one goaltenders. On the other hand, dealing Thomas might earn the Bruins an upgrade or significant futures, but such a scenario is a major risk. Extra-curriculars aside, Thomas will be a borderline-legendary figure in Boston sporting history – and dealing a star/legend is perilous on numerous levels. Rask could be injured – or struggle mightily. Khudobin could falter. Thomas could lead his adoptive franchise against the B’s in the postseason (which is the major reason that if Timmy is dealt, he’ll be dealt out West) and doubting a motivated Thomas is never advisable. The B’s will probably scrutinize their options and decide that the return isn’t worth the potential headache of sending the Battlefly out the door. Last season marked the third consecutive where Boston sported a mediocre man-advantage during the regular season (fifteenth in the NHL with a 17.2% success rate) and the second straight year where the team had struggled with the PP through the postseason. Whether the issue is with coaching, personnel or luck the fact remains that a team which has had a top-five offense in three of the past four seasons should be better on the powerplay. If they do go about trying to add some plus-PP-performers, they should start with mobile distributors from the point. Too frequently the defensemen in the B’s man-advantage setup were stationary, setting up predictable passing lanes and uninspired one-timers from the blueline. Adding another sharp-shooter up front would be advisable to take some of the production-pressure off of guys like Seguin and Krejci (and perhaps bump one of the less-inclined forwards off the man-advantage). The B’s possess a deep and talented forward corps and the ultra-mobile blueliner Dougie Hamilton appears Boston-bound in ’12-’13, and both limit pressure to make a major move. Chiarelli has been loath to jump in feet-first to the bonanza of unrestricted free agents in recent off-seasons. His biggest acquisition in the past three years (via the UFA market) was arguably Derek Morris in ’09. Preferring to build through trades and the draft, it’s doubtful the B’s GM will jump through hoops to go after one of the bigger fish this summer. Still, he won’t ignore what he perceives to be glaring needs. The B’s need some help moving the puck and creating offense from the blue line. While Ryan Suter fits the bill, he doesn’t fit the budget and someone like Johnny Oduya or Matt Carle could be short-term solutions while Hamilton matures. Additionally, the Bruins could fill from within with offensive-minded blueliners like Torey Krug and David Warsofsky in the organization. Similarly, while the thought of adding a Zach Parise to the B’s attack is a delicious dream for Boston fans, it’s all but a fantasy. Bargain-basement options like former-Bruin Brad Boyes, Bisquick poster-child Dustin Penner or AARP-bound Ray Whitney for some budget-savvy punch. The talented Ryan Spooner, Jared Knight and others could be knocking on the door of the Garden by December to help fill out some secondary scoring roles.